This bean goes through a Swiss Water Process which uses water from the pristine environment of the coast mountains of British Columbia, Canada to gently remove the caffeine until the coffee beans are 99.9% caffeine-free, while maintaining the bean's distinctive origin and flavor characteristics. It's decaffeinated coffee without compromise. Coffee decaffeinated using the environment-friendly Swiss Water Process undergoes regular caffeine level audits to ensure compliance to 99.9% caffeine-free. Our Story: - JOURNEY TO THE PERFECT BEAN - A licensed Q-Grader who imports coffee from around the world, then sells to National award winning roasters. No order is too large or too small, if we have it (or are anticipating it) we will sell it to you. We break up large lots to sell small quantities of coffee to home roasters. This gives our home roasters the opportunity to try their hand at roasting the exact coffee they saw their favorite micro-roaster selling. This is something most importers will not do, because the transaction and customer service cannot be facilitated at their profit margin. These beans were grown in various regions of Sumatra, Indonesia: Lake Tawar, Aceh, and Lake Toba. This coffee was grown at an altitude of 1,400 meters. 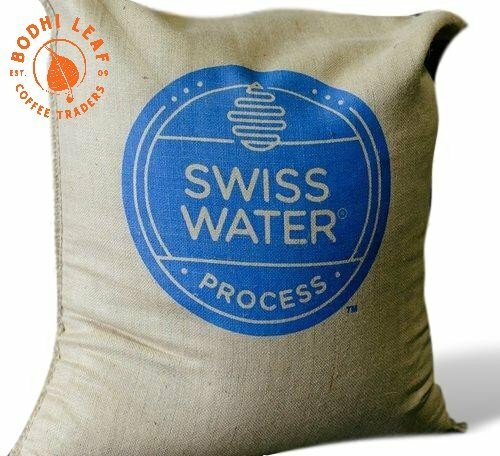 This bean goes through the Swiss Water process, a decaffeinating method that uses no chemicals. Good For Any Brewing Method!